Greenhouses in New York are additionally entrusted to perform two conflicting roles, namely, to fulfill consumer demands for increased production of local vegetables and to drastically decrease overall energy consumption. 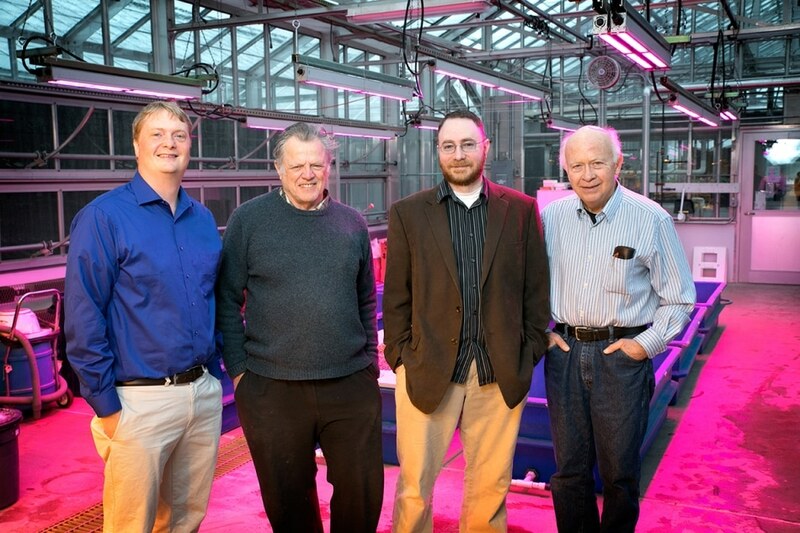 From left, Neil Mattson, Associate Professor in the Horticulture Section of the School of Integrative Plant Science (SIPS); David de Villiers, Research Associate, SIPS; Kale Harbick, Research Associate, SIPS; and Lou Albright, Professor Emeritus in the Department of Biological and Environmental Engineering, at the Kenneth Post Laboratory greenhouses. CREDIT: Chris Kitchen/University Photography. Scientists from Cornell University and Rensselaer Polytechnic Institute (RPI) have formed a public-private consortium—The Greenhouse Lighting and Systems Engineering (GLASE) consortium—that is working towards achieving both. Declared on 5th June 2017, the consortium will revolutionize the operations of greenhouses to minimize the usage of electricity for lighting by nearly 70%. GLASE is headed by Neil Mattson (an Associate Professor at the Horticulture Section of the School of Integrative Plant Science) and his colleagues from RPI, and establishes a holistic greenhouse energy management system that combines carbon dioxide supplementation, humidity, control of LED lighting and ventilation. The $5 million, seven year study funded by the New York State Energy Research and Development Authority (NYSERDA) is sure to advance the energy policy of Governor Andrew M. Cuomo, namely, Reforming the Energy Vision, of which the goal is to minimize greenhouse gas emissions by up to 40% from the levels prevalent in 1990. Engineers are working to produce energy-efficient light-emitting diode (LED) plant-lighting systems at the Center for Lighting Enabled Systems & Applications (LESA) at RPI. In contrast to high-pressure sodium bulbs that are conventionally used to light up greenhouses, LED lights can be made dim and the spectrum can be altered to correspond to ideal wavelengths. Horticulture experts at Cornell University will work in cooperation with Tessa Pocock, Photobiologist at LESA, to investigate dynamic lighting and control systems with the ability to adapt to effectively provide light to plants. According to Mattson ‒ Director of the Controlled Environment Agriculture group at the College of Agriculture and Life Sciences, reactive lighting empowered by LED technologies enables growers to provide ideal lighting because the conditions get modified all day. Mattson’s study at the Kenneth Post and Guterman greenhouse facilities located at the Ithaca campus will establish accurate LED lighting and regulation approaches that are optimal for tomatoes, strawberries and lettuce as models. An ability to adjust in real time the light spectrum and light quantity means plants get consistent, uniform, reproducible light at all times. That means we’re not wasting light and the electricity needed to create it when plants don’t need it for growth. The prevalent trends in the state of New York indicate that more vegetables are grown indoors. The latest census data from the U.S. Department of Agriculture indicate a 10.6% increase in the cultivation of tomatoes and lettuce in New York per year between 2007 and 2012. This is an industry that continues to expand in the vegetable-growing sector. This investment in energy-efficient greenhouse production will help ensure New York’s continued leadership in local food production in the Northeast. Apart from water and light, plants need carbon dioxide to initiate photosynthesis. Prior studies by Lou Albright, who is Professor Emeritus at the Department of Biological and Environmental Engineering, have demonstrated that if the surrounding environment is rich in carbon dioxide, lettuce requires considerably less supplemental light. Mattson and his colleagues will investigate the manner in which the growth of strawberries and tomatoes depends on carbon dioxide supplementation. Kale Harbick and Tim Shelford, Biological and Environmental Engineering collaborators from Cornell University, will use the data gathered from Mattson’s studies to create algorithms that can be used by growers to make dynamic decisions related to ideal carbon dioxide and lighting conditions. During the entire project, Mattson and his colleagues will work alongside partners from the industry to investigate strategies in commercial facilities and to keep track of the carbon footprint of their functions. The GLASE consortium will collaborate with Growers, Researchers, Produce Buyers, Lighting Manufacturers, Government Agencies, Trade Groups, Agriculture Lighting Engineers, Cornell Cooperative Extension specialists and others. New York’s greenhouse industry is experiencing rapid growth, making quick and meaningful action key to ensuring new and existing greenhouses are energy-efficient and highly productive. The consortium’s work will advance Gov. Cuomo’s energy goals and New York’s vital agriculture sector. According to Mattson, GLASE has been established to endure as a self-sustaining group. At the end of the seven-year funding obligation, the consortium proposes to continue the collaboration with partners as well as companies to create an organization that responds to the requirements of the industry.